THE RELIGION OF THE OMAHAS. THE RELIGION OF THE OMAHAS AND PONKAS. BY THE REV. J. OWEN DORSEY. The idea of a Supreme Being is said to have existed among the Omahas and cognate tribes prior to the coming of civilization. The writer heard this not only from Joseph La Fleche, now a Christian, but also from men still holding their ancestral faith. One of these, Two Crows, has been connected in several ways with the ancient organizations of his people. He is now one of the head men or nikagahi of his tribe, and is thus ex-officio a member of the class which exercises the religious and civil functions of the state. He has been a policeman during the buffalo hunt. He has acted as captain, or war-chief; and he is the leading doctor in the Buffalo dancing society. Padhiⁿ-naⁿpaji, or He-who-fears-not-the-sight-of-a-Pawnee, is one of the servants of the Elk clan, whose duty it is to be present at the sacred tent of that clan, and assist in the ceremonies pertaining to the worship of the thunder-god. From these and others the writer has learned about their ancient beliefs, having taken care not to question them in the presence of an interpreter. When there were no white people in this land, the ancestors of the Omahas and Ponkas believed that there was a Superior Being, whom they called Wakanda-Wakanda t'aⁿ i tĕ edheganⁿ. They believed that Wakanda existed. They did not know where He was, nor did they undertake to say how He existed. 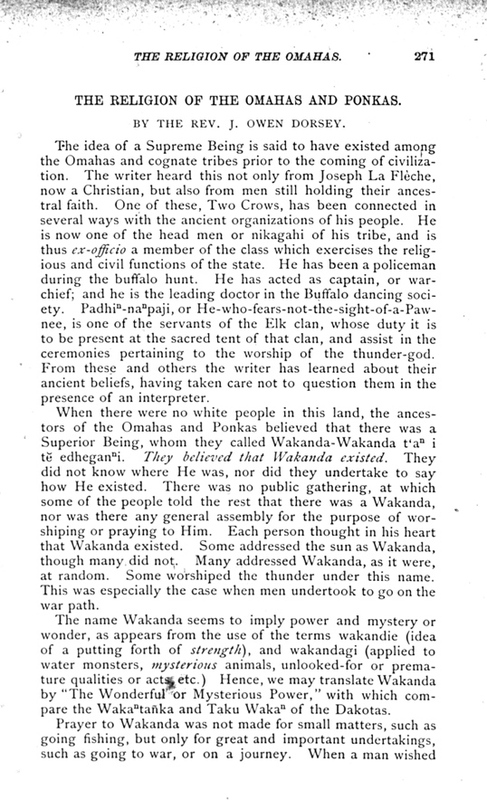 There was no public gathering, at which some of the people told the rest that there was a Wakanda, nor was there any general assembly for the purpose of worshiping or praying to Him. Each person thought in his heart that Wakanda existed. Some addressed the sun as Wakanda, though many did not. Many addressed Wakanda, as it were, at random. Some worshiped the thunder under this name. This was especially the case when men undertook to go on the war path. The name Wakanda seems to imply power and mystery or wonder, as appears from the use of the terms wakandie (idea of a putting forth of strength), and wakandagi (applied to water monsters, mysterious animals, unlooked-for or premature qualities or acts, etc.) 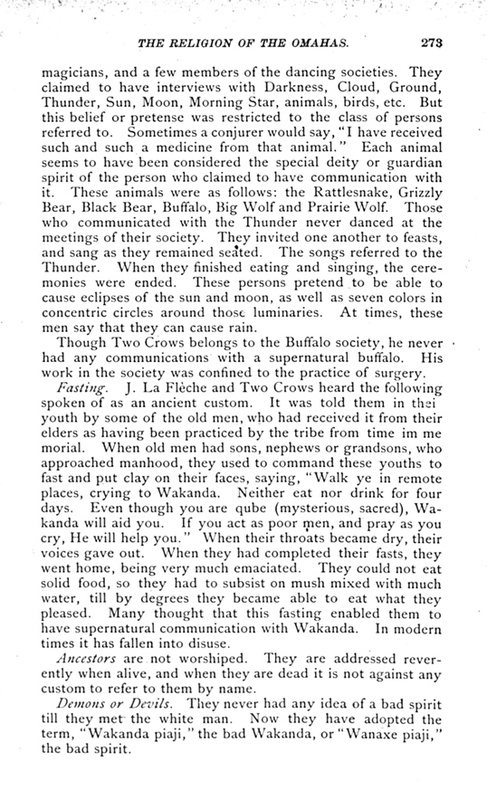 Hence, we may translate Wakanda by "The Wonderful or Mysterious Power," with which compare the Wakaⁿta�ka and Taku Wakaⁿ of the Dakotas. to travel, he used to go alone to a bluff, and pray to Wakanda to help him. Compare the Dakota custom of praying to a boulder on a Prairie, called Tu�kaⁿ shidaⁿ, or grandfather, symbolizing the earth deity. The places for prayer are rocks, mountains, and high cliffs. All the Omahas go to such places to pray, but according to Frank La Fleche, they do not pray to the visible object, though they call it grandfather. Yet they do not smoke towards the object, and place on it presents of killickinnick, etc. When animals detected the approach of the hunter by the odor wafted by the wind, and consequently fled from him, the latter prayed thus, "Ho! Wakanda, you may have given me an animal, but it seems that you have taken it back. I hope that you will cause one to appear again for me." But if he shot at one and missed it, he said nothing. Padhiⁿ-naⁿpaji gave the following, which has been doubted by J. La Fleche and Two Crows: "The superior deities are seven. Darkness is a great deity. The others are the Sky, the Ground, Thunder, the Sun, the Moon, and the Morning Star. The principle deity is in the sky or upper world, above everything." These were doubtless the deities worshiped by himself and the other men of his clan. He also said, "Warmth is a good diety. Ni dhiⁿ, The flowing water, is thus addressed by the man wishing to ford it: You are a person and a diety. I, too, am a person. I desire to pass through you, and reach the other side." Two Crows said that they never prayed to the water, though some did appeal to a subterranean Wakanda when their word was doubted, saying, "The venerable man under the ground hears me." During the ordeal of the wastegistu, the successful warriors were called on one by one to address one of the sacred bags as grandfather, at the same time dropping a stick, which was supposed to rest on the bag if the man had told the truth. Though J. 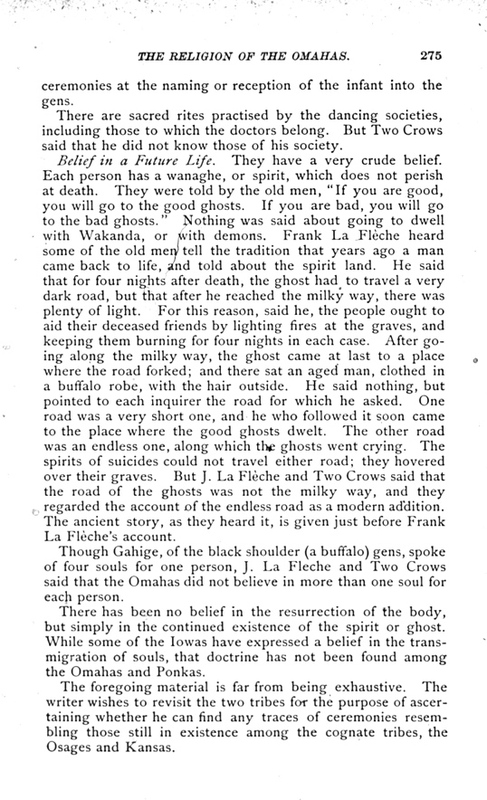 La Fleche and Two Crows said that a high bluff was merely a place for praying to Wakanda, and was not addressed as Wakanda, the writer has learned from members of the two tribes that when they went on the war path for the first time, and their names were changed, one of the old men was sent to the bluffs to tell the news to the various deities, including the bluffs, trees, birds, reptiles, insects, etc. The originals of these addresses will appear in Vol. VI. Part I. of Contributions to N. A. Ethnology. magicians, and a few members of the dancing societies. They claimed to have interviews with Darkness, Cloud, Ground, Thunder, Sun, Moon, Morning Star, animals, birds, etc. But this belief or pretense was restricted to the class of persons referred to. Sometimes a conjurer would say, "I have received such and such a medicine from that animal." Each animal seems to have been considered the special deity or guardian spirit of the person who claimed to have communication with it. These animals were as follows: the Rattlesnake, Grizzly Bear, Black Bear, Buffalo, Big Wolf and Prairie Wolf. Those who communicated with the Thunder never danced at the meetings of their society. They invited one another to feasts, and sang as they remained seated. The songs referred to the Thunder. When they finished eating and singing, the ceremonies were ended. These persons pretend to be able to cause eclipses of the sun and moon, as well as seven colors in concentric circles around those luminaries. At times, these men say that they can cause rain. Though Two Crows belongs to the Buffalo society, he never had any communications with a supernatural buffalo. His work in the society was confined to the practice of surgery. Fasting. J. La Fleche and Two Crows heard the following spoken of as an ancient custom. It was told them in their youth by some of the old men, who had received it from their elders as having been practiced by the tribe from time in memorial. When old men had sons, nephews or grandsons, who approached manhood, they used to command these youths to fast and put clay on their faces, saying, "Walk ye in remote places, crying to Wakanda. Neither eat nor drink for four days. Even though you are qube (mysterious, sacred), Wakanda will aid you. If you act as poor men, and pray as you cry, He will help you." When their throats became dry, their voices gave out. When they had completed their fasts, they went home, being very much emaciated. They could not eat solid food, so they had to subsist on mush mixed with much water, till by degrees they became able to eat what they pleased. Many thought that this fasting enabled them to have supernatural communication with Wakanda. In modern times it has fallen into disuse. Ancestors are not worshiped. They are addressed reverently when alive, and when they are dead it is not against any custom to refer to them by name. Demons or Devils. They never had any idea of a bad spirit till they met the white man. Now they have adopted the term, "Wakanda piaji," the bad Wakanda, or "Wanaxe piaji," the bad spirit. Hero Worship, the worship of demi-gods, and phallic worship are unknown. Two Crows and J. La Fleche were surprised to hear that the latter was the custom in any tribe. Fetichism. Inanimate objects are not worshipped, though there are some who consider as sacred the skins of animals, and the skins and feathers of such birds as are used for their sacred bags. Among these are the eagle, sparrow-hawk, yellow-backed hawk, green-necked duck, great owl, martin, otter, flying-squirrel, mink, mika-ska (white raccoon? ), and mazaⁿhe. J. La Fleche and Two Crows never heard of mika-ska and mazaⁿhe among the Omahas, but Padhiⁿ-naⁿpaji gave them as so used. Though the Omahas have stories of four creators, the Muskrat, the Beaver, Flying-squirrel and Kingfisher, those belong to the realm of the higaⁿ or myth, which is called an "iusishtaⁿ iudha," or lying tale, which no one believed. It was "ikha-wadhe-as adhiahaⁿ," pertaining to the ludicrous, being told only for amusement. Totems have not been worshiped, though there is a sacredness associated with what are called nikie or ancient tribal names, the sacredness of antiquity, such names having been transmitted from the earliest ages of the existence of the tribe, and containing references to the mythical orgin of the people. But they are not "uwaqube" (sacred ordinances) nor are they "Wahandataicaⁿ," of religious signification. 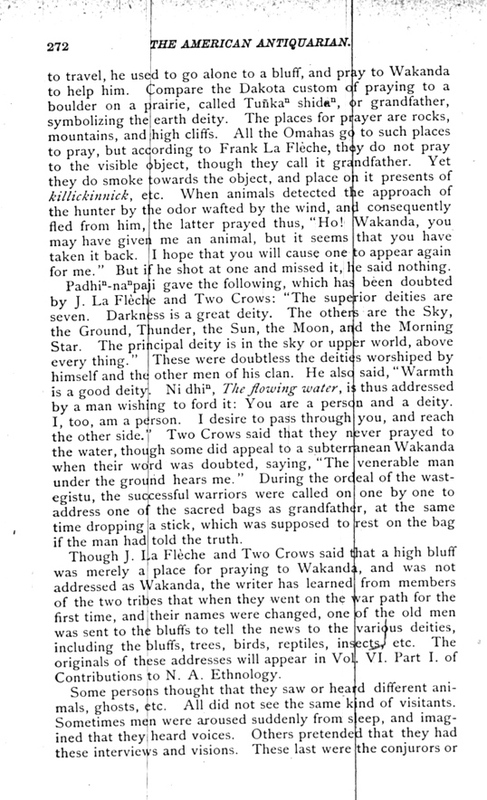 Shamanism, the worship of the sacred men and women is not practiced, though some of these sacred persons pretended to be Wakandas, as did the Ponka Naⁿbe-dhiku, when he saw the writer. J. 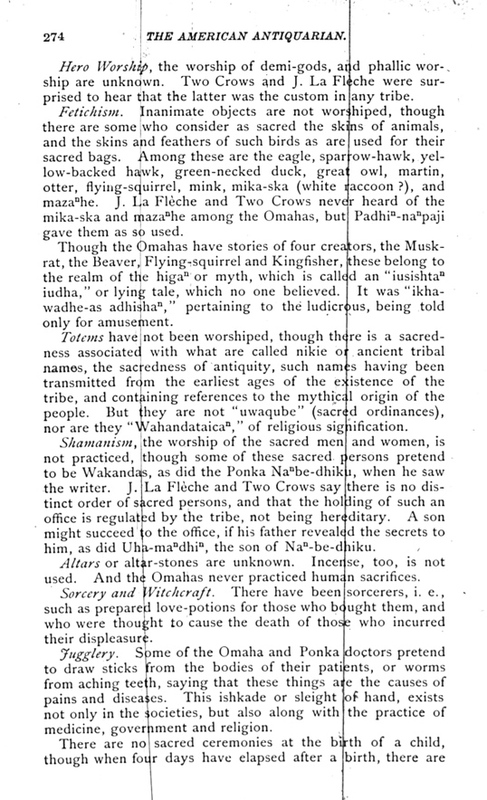 La Fleche and Two Crows say there is no distinct order of sacred persons, and that the holding of such an office is regulated by the tribe, not being heredity. A son might succeed to the office, if his father revealed the secrets to him, as did Uha-maⁿdhiⁿ, the son of Naⁿ-be-dhiku. Altars or altar-stones are unknown. Incense, too, is not used. And the Omahas never practiced human sacrifices. Sorcery and Witchcraft. There have been sorcerers. i.e. such as prepared love-potions for those who bought them, and who were thought to cause the death of those incurred from their displeasure. Jugglery. Some of the Omaha and Ponka doctors pretend to draw sticks from the bodies of their patients, or worms from aching teeth, saying that these things are the causes of pains and diseases. This ishkade or sleight of hand exists not only in the societies, but also along with the practice of medicine, goverment and religion. ceremonies at the naming or reception of the infant into the gens. There are sacred rites practised by the dancing societies, including those to which the doctors belong. But Two Crows said that he did not know those of his society. Belief in a Future Life. They have a very crude belief. Each person has a wanaghe, or spirit, which does not perish at death. They were told by the old men, "If you are good, you will go to the good ghosts. If you are bad, you will go to the bad ghosts." Nothing was said about going to dwell with Wakanda, or with demons. Frank La Fleche heard some of the old men tell the tradition that years ago a man came back to life, and told about the spirit land. He said that for four nights after death, the ghost had to travel a very dark road, but that after he reached the milky way, there was plenty of light. For this reason, said he, the people ought to aid their deceased friends by lighting fires at the graves, and keeping them burning for four nights in each case. After going along the milky way, the ghost came at last to a place where the road forked; and there sat an aged man, clothed in a buffalo robe, with the hair outside. He said nothing, but pointed to each inquirer the road for which he asked. One road was a very short one, and he who followed it soon came to the place where the good ghosts dwelt. The other road was an endless one, along which the ghosts went crying. The spirits of suicides could not travel either road; they hovered over their graves. But J. La Fleche and Two Crows said that the road of the ghosts was not the milky way, and they regarded the account of the endless road as a modern addition. The ancient story, as they heard it, is given just before Frank La Fleche's account. Though Gahige, of the black shoulder (a buffalo) gens, spoke of four souls for one person, J. La Fleche and Two Crows said that the Omahas did not believe in more than one soul for each person. There has been no belief in the resurrection of the body, but simply in the continued existence of the spirit or ghost. While some of the Iowas have expressed a belief in the trans-migration of souls, that doctrine has not been found among the Omahas and Ponkas. The foregoing material is far from being exhaustive. The writer wishes to revisit the two tribes for the purpose of ascertaining whether he can find any traces of ceremonies resembling those still in existence among the cognate tribes, the Osages and Kansas.